then tossed them with butter and cream. 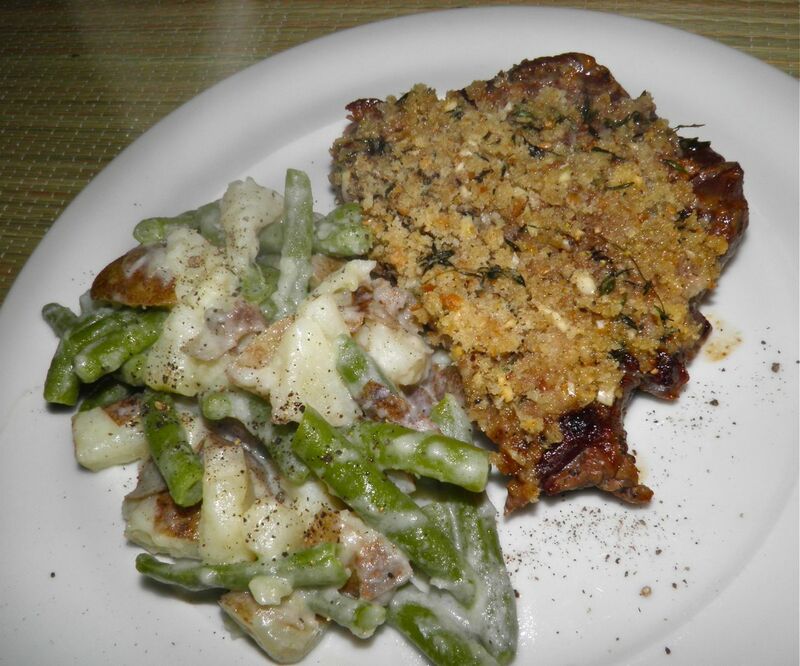 Have you ever been disappointed in your pan fried steak? You know what I mean – burnt on the outside and dry on the inside, or perfect on the outside and far too pink when you cut into it. I really should have cut these into four portions. I know there are many people who like their steak "blue" (the fancy term for raw in the centre) but those people are few in the grand scheme of steak eaters. I am not one of them. Raw steak doesn't turn me on. I guess I'll never experience Steak Tartar. My loss. When you go to a restaurant the chefs don't seem to have any problem cooking the perfect steak. Beautifully browned outside and juicy inside. Many restaurants have indoor grills, but many also use another method – direct and indirect heat. 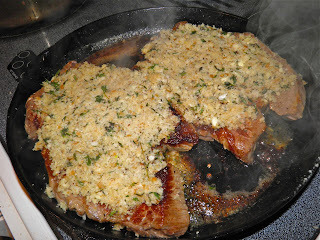 I prefer my old cast iron pan to sear, but any oven proof pan will work. 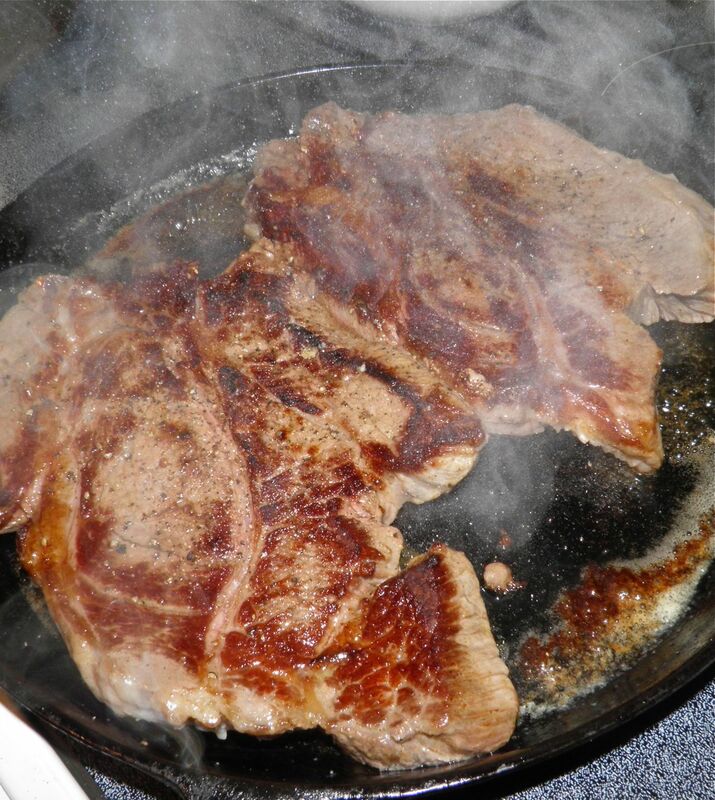 Pan browning and then finishing steak slowly in the oven allows you to have the best of both worlds. Repeat after me: direct and indirect heat. Some people on the inter-web say this is some kind of restaurant secret. I highly doubt it, unless there's a conspiracy of silence that encompasses every student at every community college food service program around the world. If you've never finished a steak in the oven before you really should try. It's the same principle as spatchcocked chicken. Both results are browned outside and tender and juicy inside. Perfect result and the oven does all the work. You can do it on a barbecue with a lid, too. Direct and indirect heat. pulses is all it takes. Since it's already in the oven, baking a crunchy crust on it makes perfect sense. 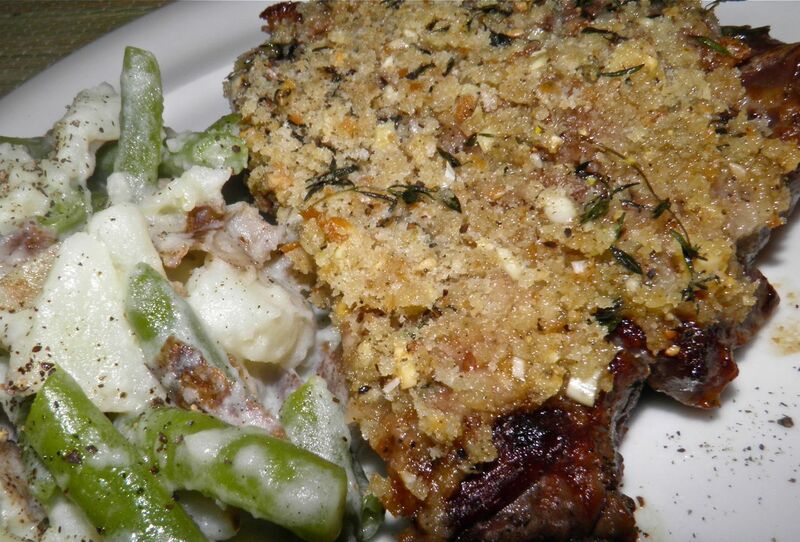 This one consists of bread crumbs, butter and plenty of garlic and thyme. It's all you need to dress steak for company, or to treat yourself. The bread crumbs brown slightly as it bakes and the garlic heats through and becomes aromatic. It smells and tastes wonderful. By the way – always, always, always let any roasted meat rest for a few minutes before cutting. If you don't, all those juices that make the meat so moist end up gushing out onto the carving plate. So give it a rest. OK? In an oven proof frying pan, heat the olive oil. Sear the steaks on both sides until nicely browned, but not cooked through, about 2 minutes per side. Season with the salt and half the pepper as they fry. Combine the grated bread, garlic, thyme and remaining pepper. 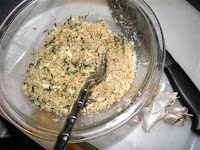 Melt the butter and add to the bread crumbs and mix well. Evenly press the crumb mixture on top of each steak. Place the pan in the hot oven and let cook until the steaks are done to your liking by testing with an instant read thermometer. For rare 135°F, medium-rare 145°F, medium 160°F, and well-done 170°F. Between Medium and Well is 18 minutes. Let the steaks rest for 3-5 minutes so the internal juices redistribute. Serve with snapped green beans cooked with diced potatoes, all tossed with butter.